Seashore is a nonprofit organization and contributions are tax-deductible. ​Monetary donations allows Seashore to provide quality programs and activities for youth and adults in our community. You can make a donation online using your debit/credit card or PayPal account. Simply click the button below. It’s simple, safe and easy. You may use your credit card or PayPal account. Make a One Time Donation. Purchase on AmazonSmile and Amazon will make a Donation to Seashore. Donations In-Kind (Blankets, Jackets, Food, etc.) are gladly accepted. the Latest Events, Photos, and Videos. 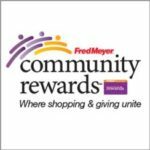 * You will still get your own Fred Myer Rewards Points, Fuel Points and Rebates!